The weather upstate has been so strange and variable—an early heat spell, followed by cold, then way too much rain and not enough sun—that there has been disappointingly little progress with the plants. The mint patches are lush, the shiso, sage and lemon balm are doing well, and the first squash blossoms have appeared, but the cucumbers have scarcely put out a few tendrils. New Jersey has been luckier, however, and there were already piles of newly picked Kirbys at the farmers market in Union Square last week. I bought about 8 pounds in preparation for our annual pulled pork fest on the 4th. 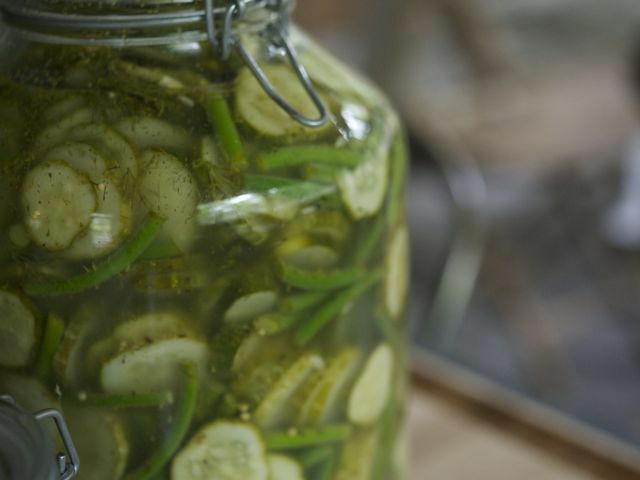 Pickles are essential for barbecue! They're a traditional counterpoint to all that fatty meat, and really aid in its digestion. You may remember from last year that I make both dill and bread-and-butter chips. The dills are lacto-fermented, which means all you have to do is slice them up and put them in a jar with salt and whatever spices you like and let them sit on the counter for a few days. Nature will do the rest, creating the right natural bacteria to give your pickles their requisite tang. This year I added one new ingredient to the dill pickles: dill pollen! I think you've heard me rave about fennel pollen already, and the dill pollen has similar qualities. It's a grainy yellowish powder that has the muted but still potent aroma and flavor of dill. I ordered mine from Pollen Ranch; their site has some other recipes that use dill and fennel pollens if you're interested. Picklers tend to be shorter, thicker, less regularly shaped and have bumpy skin with tiny white- or black-dotted spines. (The cukes, not the people!) They are never waxed. Color can vary from creamy yellow to pale or dark green. In a nonreactive saucepan, bring to a boil the vinegar, water, salt and sugar. Remove from heat and cool. Pack the peas, garlic, chiles and herbs into a 1-quart jar. Pour the cooled liquid over the peas, and cover the jar with a nonreactive cap. Store in the fridge for a week or two before eating. They will keep for several months refrigerated. The dill brine looks a little cloudy because i use whey to aid in the fermenting. Bread-and-butter chips are my favorite, though i use less sugar than standard recipes. I used fresh basil and chiles with my sugar snaps.